Missy Higgins was also on the bill, but I arrived after she had finished. I actually arrived in the middle/end of Brett Dennen’s set. I like his newest CD, and I was curious to hear what he sounded like live. I remember that I heard the CD a couple of times before I ever saw a picture of him. When I did see a picture of him, I was shocked at the mismatch between his voice and his face. I’m not sure exactly what I was expecting, but it wasn’t this. In the picture I saw his red hair was shaped in an almost bowl-cut, which didn’t do any favors to his very young and somewhat androgynous face. When I saw him last night, it looks like he is in the process of growing his hair out, but the length it is now isn’t really doing him any favors. Add to this the rainbow guitar strap and librarian-looking glasses he was wearing for at least part of the set, and you’ve got a very unique look indeed. Still, his look reinforced one of the great things about music: when you’re talented it doesn’t matter what you look like. In some ways it’s better when you can shock people with what comes out of your mouth, and that what this guy can do. When we came in he was playing a song solo – just him and his guitar, and his voice and lyrics were able to captivate the sizeable crowd enough to keep them whisper quiet. I was glad to see his band re-emerge after that tune, but unfortunately they only played another 3-4 songs before they wrapped up their set. I enjoyed what I saw and I’d definitely pay to see him again. 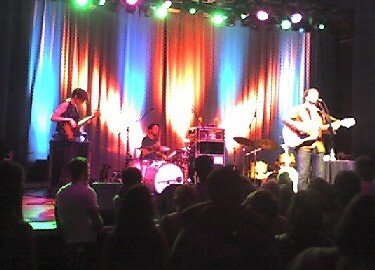 The set break wasn’t too long, and Mason Jennings took the stage as the headliner. He started the show as a solo act – just him and acoustic guitar. It was a cool way to open the show and he started with two of my favorite songs (full setlist below), but I was also happy to see a bass player and drummer emerge on the third song. Mason Jennings has also grown more hair since the pictures I’ve seen of him, but it works well for him. Unlike Mr. Dennen, when I first saw a picture of MJ, I was surprised at how unremarkable he looked. At a glance, he looks like anybody – a guy who works at starbucks, or not-too-hipster web designer. In person he has a little more intensity, but the longer hair helps out the musician vibe. His bass player also had the androgyny theme working – it genuinely took me a little while to tell what gender she was. She had a skater-looking haircut with really long bangs that covered much of her face. When she did show her face, she was actually fairly attractive. She also had a tattoo on her right arm of what looked like an upside-down outline of Tennessee, or a poorly drawn trapezoid. Either way, an interesting choice. His Drummer looked like the male lead character from the 1994 movie The Professional. The band members were good, but they were clearly a backing band – not doing anything too flashy. I really like Mason Jenning’s music, and this was my first time seeing him. He performed well, but didn’t change up much at all from the album versions of the songs he played. I think made one lyrical substitution in “drinking as religion,” changing the line “words are making a mess…” to “money’s making a mess…” Otherwise, it was pretty loyal to the CDs. In the Ever – that’s the name of his forthcoming album, and from the five songs he played off of the album, it sounds good. He said the name of the album was partially inspired by the crazy things his four year old son says, specifically something like “daddy, remember before I was born when I was in the ever.” Kinda cute. My favorite track after one listen is “Your new man” – it’s funny. I wish the set had been longer, but it was a solid show overall. Worth checking out if you have the chance. This entry was posted on Wednesday, May 7th, 2008 at 12:10 pm and is filed under music. You can follow any responses to this entry through the RSS 2.0 feed. Both comments and pings are currently closed. I really dug this concert, too. I also wished Mason’s set would have been longer, but when we left I realized it was the perfect amount of time and pretty much the perfect show.